It's Best For Air Quality! It's important to keep your employees as healthy as possible to keep up good workflow, but this may not be the case if the air quality is not at its best. Even in healthy workers it will cause fatigue and slow them down, and the problem is much worse for anyone with breathing troubles. Asthma sufferers and otherwise can suffer adverse reactions over time and may not be able to work at all depending on the severity. This will also negatively affect the elderly, and people with allergies will be stopping to blow their noses and deal with itchy eyes. If there's a gap in the ducts, air may be drawn in from closed off parts of the building that can contain all sorts of hazardous materials that will pollute the air and put everyone's health at risk. Keeping the ducts in good condition will prevent this! It Can Lower Energy Costs! 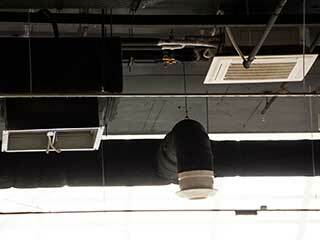 If your building's air ducts aren't in good condition, they can be a huge drain when it comes to energy spending. Even just one blockage somewhere in the system can waste energy, thanks to the air struggling to get around it to supply ventilation, air conditioning, and heating to the building. In order to properly do any of these things, the system will have to run for a longer period of time to make up for having to squeeze through, and that quickly results in a rising bill. There may also be low air flow due to the system itself starting to fail, in which case it will also be struggling to keep up and continue running to do so. The signs of malfunctioning air ducts also can serve as major distractions to your workers and may be slowing them down as well. There can be loud rattling and shaking or even nasty odors any time the system is functioning that can draw attention away from work, and hot or cold spots to deal with. Fixing the ducts can take away these attention-grabbing issues and allow everyone to work peacefully in no time!